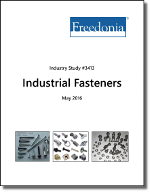 The US market for industrial fasteners is expected to increase 2.6 percent per year to $15.2 billion in 2020. This will constitute a return to more sustainable growth levels for these relatively mature products, following a surge in demand posted during the recovery-fueled 2010-2015 period. The performance of this industry has always been strongly impacted by trends in motor vehicle production, its largest end-user market. As motor vehicle output moderates, so too will associated fastener demand. The fastest growth in fastener sales will be found in the construction market, as construction activity -- both residential and nonresidential -- continues to advance at solid rates. Companies mentioned include Precision Castparts, Illinois Tool Works, Alcoa, and Stanley Black & Decker.